"Many of us have become refugees," the Dalai Lama tried to explain, "and there are a lot of difficulties in my own country. When I look only at that," he said, cupping his hands into a small circle, "then I worry." He widened his hands, breaking the circle open. "But when I look at the world, there are a lot of problems, even within the People's Republic of China. For example, the Hui Muslim community in China has a lot of problems and suffering. And then outside China, there are many more problems and more suffering. When we see these things, we realize that not only do we suffer, but so do many of our human brothers and sisters. So when we look at the same event from a wider perspective, we will reduce the worrying and our own suffering." I was struck by the simplicity and profundity of what the Dalai Lama was saying. This was far from "don't worry, be happy," as the popular Bobby McFerrin song says. This was not a denial of pain and suffering, but a shift in perspective--from oneself and toward others, from anguish to compassion--seeing that others are suffering as well. 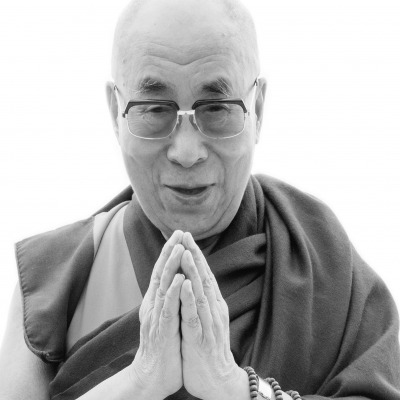 The remarkable thing about what the Dalai Lama was describing is that as we recognize others' suffering and realize that we are not alone, our pain is lessened. Often we hear about another's tragedy, and it makes us feel better about our own situation. This is quite different from what the Dalai Lama was doing. He was not contrasting his situation with others, but uniting his situation with others, enlarging his identity and seeing that he and the Tibetan people were not alone in their suffering. This recognition that we are all connected--whether Tibetan Buddhists or Hui Muslims--is the birth of empathy and compassion. I wondered how the Dalai Lama's ability to shift his perspective might relate to the adage "Pain is inevitable; suffering is optional." Was it truly possible to experience pain, whether the pain of an injury or an exile, without suffering? There is a Sutta, or teaching of the Buddha, called the Sallatha Sutta, that makes a similar distinction between our "feelings of pain" and "the suffering that comes as a result of our response" to the pain: "When touched with a feeling of pain, the uninstructed, ordinary person sorrows, grieves, and laments, beats his breast, becomes distraught. So he feels two pains, physical and mental. Just as if they were to shoot a man with an arrow and, right afterward, were to shoot him with another one, so that he feels the pain of two arrows." It seems that the Dalai Lama was suggesting that by shifting our perspective to a broader, more compassionate one, we can avoid the worry and suffering that is the second arrow. "Then another thing," the Dalai Lama continued. "There are different aspects to any event. For example, we lost our own country and became refugees, but that same experience gave us new opportunities to see more things. For me personally, I had more opportunities to meet with different people, different spiritual practitioners, like you, and also scientists. This new opportunity arrived because I became a refugee. If I remained in the Potala in Lhasa, I would have stayed in what has often been described as a golden cage: the Lama, holy Dalai Lama." He was now sitting up stiffly as he once had to when he was the cloistered spiritual head of the Forbidden Kingdom. "So, personally, I prefer the last five decades of refugee life. It's more useful, more opportunity to learn, to experience life. Therefore, if you look from one angle, you feel, oh how bad, how sad. But if you look from another angle at that same tragedy, that same event, you see that it gives me new opportunities. So, it's wonderful. That's the main reason that I'm not sad and morose. There's a Tibetan saying: 'Wherever you have friends that's your country, and wherever you receive love, that's your home.'" Spiritual leader of the Tibetan people.